Ever wanted to share access to a playlist with co-workers, other salespeople on your team, or even clients so that they can make updates to it and add or remove items? Well now you can with the new "Share/Collaborate" feature on every playlist page. With this new feature you can give read-only or full-editing rights to as many people as you'd like with just a couple of clicks. One awesome new part about this feature is that when someone else is viewing the same playlist as you at the same time you'll see who else is viewing it, in real-time, so you know someone else might also be making changes. Even if they do make changes you'll see them reflected in the project in real-time, right on the page you're viewing - it will actually live-update right in front of you. Admins can see all users who are viewing the playlist, and regular users can only see admins. Now go collaborate away! Just like albums, artists, labels, and catalogs, you can now add images to playlists. Just click the "Edit Playlist Info" link in the "More Actions" drop-down on any playlist and you'll see the info overlay appear. These descriptions and images are going to become more and more important for discovery as we continue to add additional buyer sites to the network. The better and more complete your descriptions, the more easily they'll be discovered in search results, and the more often your playlists and tracks will be put in front of network buyers. You will be able to add a new "Playlists" tab to your site to feature your best or most-timely packages and playlists to all users by publishing them in one simple click. We're calling this new type of Playlist "Public", meaning all users to your site will be able to view these new public playlists without having to receive a direct link. We're making sending a private playlist even easier. At times your site settings (sites that require registration along with music access profiles that affect track visibility for certain users) can interfere with playlist access and not all tracks appear as expected for non-logged in users. We're improving this. If you create a private/non-public playlist and you send the link directly to a user, they'll be able to view all tracks in that playlist within the context of that playlist regardless of your site settings and music access profile limitations. This will make it much easier to send your non-logged in clients bundles of tracks and you won't have to worry about them not seeing every track you want them to audition and download. 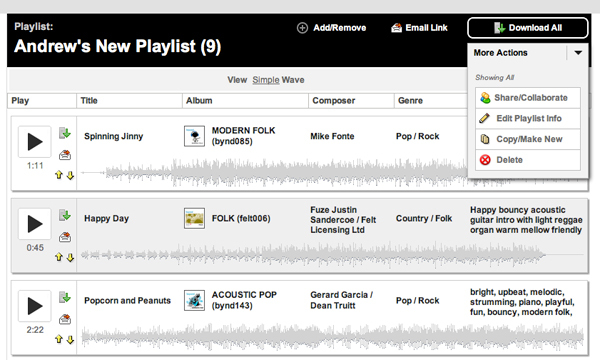 Your clients will have direct access to download playlists straight from their emails. This is the last improvement to Playlists we're making in Part 2 and it's going to make downloading playlists fast and extremely simple. When a Playlist is emailed through your site to a client/user, they will have the option to skip going to the site altogether and they can simply download the playlist straight from their email. This will work just like YouSendIt, but you'll never have to leave your SourceAudio site. Pretty cool stuff. So there it is. We'll let everyone know when Part 2 is done! Stay tuned...and as always, feel free to reach out with any questions. « Published Playlists Are Live!